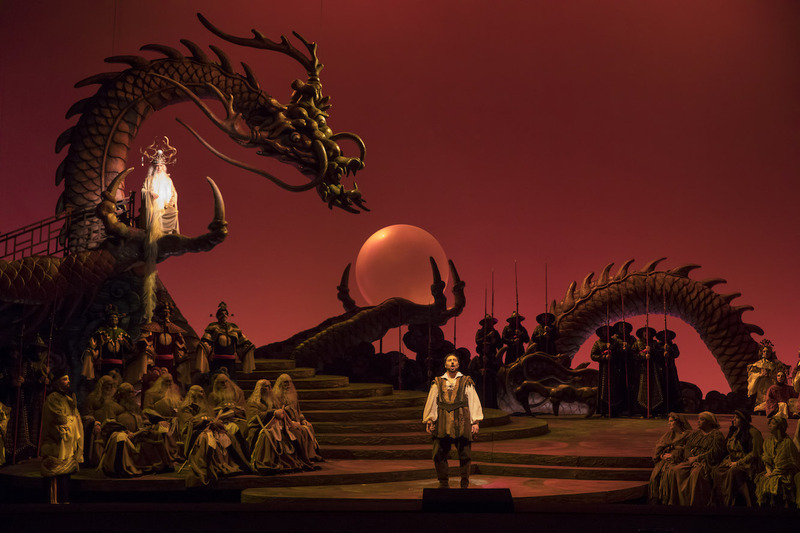 This is a review of the Friday, December 8, 2017 performance of Lyric Opera of Chicago’s Turandot, the second performance of the run. Lyric Opera of Chicago has spoiled us this season. Audiences have had the great fortune of witnessing some of the best vocal performances on stage anywhere in the world. 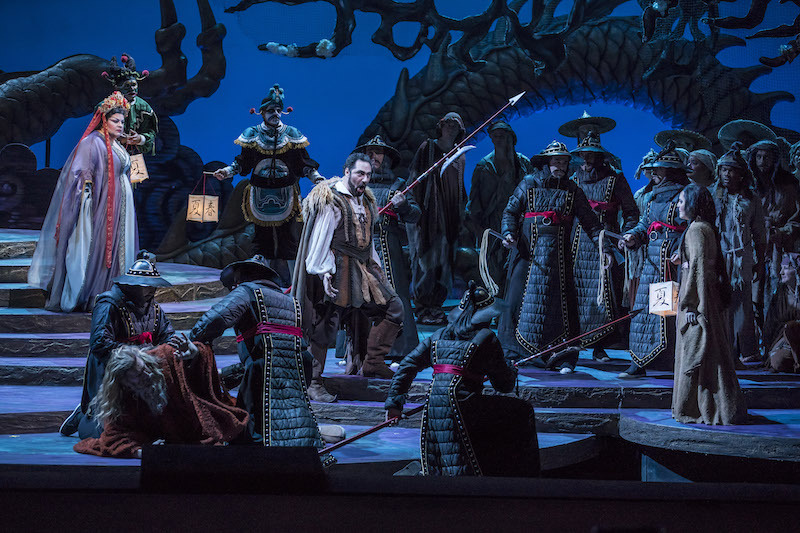 The company’s latest production of Puccini’s last, unfinished opera, Turandot, is chock-full of wonderful moments, but if pressed to rank the five mainstage productions I’ve seen thus far at the Lyric Opera House this season (no small feat given what we’ve seen! ), I would place it somewhere in the bottom half. 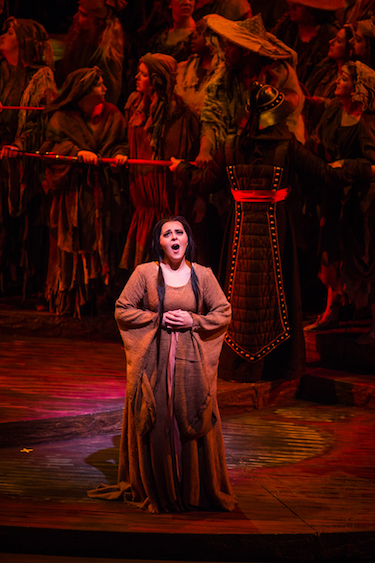 Leading the cast was American soprano and Ryan Opera Center alumna Amber Wagner as icy Princess Turandot. Though Turandot only sings about 20 minutes in the entire two hours of the opera, it’s a formidable 20 minutes. Fortunately, Wagner was up to the task. Her powerful, Callas-esque soprano has a solid, beautiful core, making her an ideal Puccini soprano. I was taken by the warmth of her voice, and she was in full command of every part of her range. Making his Lyric Opera of Chicago debut, Italian tenor Stefano La Colla played a confident Prince Calaf. Early on in the evening, La Colla’s sound reminded me of a young Domingo. The strength of his voice was somewhat wanting, but it seemed to grow as the night went on, as did his level of comfort, so that by the time the Act III favorite “Nessun Dorma” came along, we were able to bask in the sound of a magnificent spinto tenor. One of the gems of the evening was Italian soprano Maria Agresta’s Liù. The audience roared with approval during the curtain call, and rightly so. Her supple middle range and gorgeous pianissimo upper register were breathtaking. Agresta is making her Lyric debut in this production; I hope to see her on stage in Chicago again soon! Andrea Silvestrelli’s booming, buzzy bass was in excellent shape. Playing Timur in Turandot, this Lyric favorite is currently involved in another production at the company: The Pearl Fishers (Nourabad). Silvestrelli clearly feels at home on stage at the Lyric Opera House, and he is always a pleasure to see and hear. 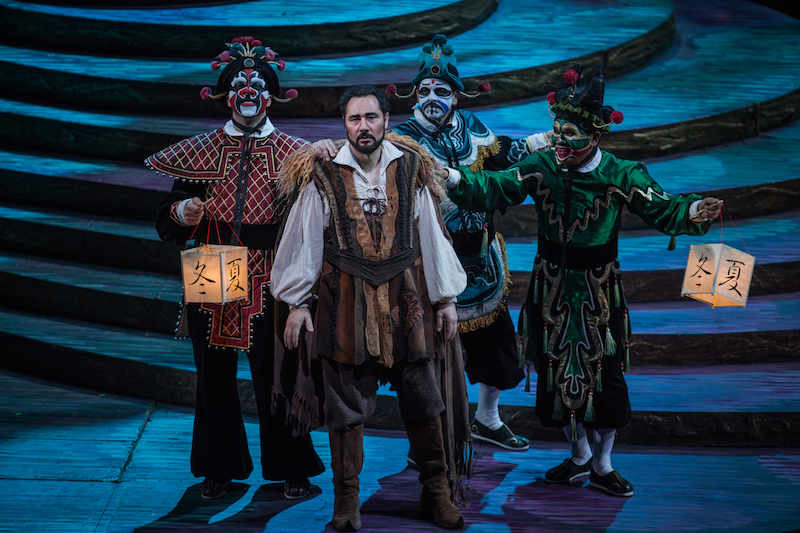 Other notable vocal performances in the production include Zachary Nelson’s Ping (Zachary played Donner last season in Lyric’s Das Rheingold), Ryan Opera Center alumnus Rodell Rosel’s Pang, and Keith Jameson’s Pong. The trio worked well together, and brought in some much needed comic relief. Patrick Guetti’s substantial baritone allowed him to cut through a powerful orchestra, making him an excellent Mandarin. Tenor Josh Lovell, another current member of the Ryan Opera Center, played Emperor Altoum. Lovell’s young sound belied the great age of the emperor, emphasized by a white beard that stretched far longer than Lovell is tall. That said, there can be no doubt that he possesses a beautiful tenor tone. Turandot is full of chorus numbers, and these were particularly strong. The Chicago Children’s Choir deserves special mention, as they were phenomenal. Sir Andrew Davis led a fantastic Lyric Opera of Chicago orchestra. There were times, however, when I felt as though I were listening to a symphony instead of an opera. Davis brought out Puccini’s genius for orchestration, but one problem I noticed consistently was balance. I had to strain my ear more than usual to hear singers over the orchestra. I believe that part of the problem may have been the staging; so much of the singing occurred too far upstage. When singers moved closer to the audience, I found that I had much less trouble hearing them. All things considered, it was an enjoyable night at the opera, though I couldn’t help but feel that a spark was missing. Puccini lovers will undoubtedly love the sounds they encounter, and I encourage any and all operagoers in the Chicago area to go see this production. I found the score disagreeable as there is little lyricism, mostly aggression and Intermittent choppy attempts to add a Chinese flavor to the sound. That is Puccini’s fault. The staging was also unpleasant, with the stage constantly flooded with one or another garish color, the actors behaving as if the Princess and Empiror are harmless celebrities rather than feared cruel overlords, the acting mostly wooden , and costumes colorless. The princess looked and behaved in an undistinguished way. All in all , besides the singing by Liu, Timur, and the Ping Pong trio, and the famous “Sleeping” solo, there was not much worth seeing or hearing for me. Turandot’s part was doubtless sung well but Puccini made her music harsh and not to my taste.